It was nearing the middle of the night on Wednesday, March 8, 2017. 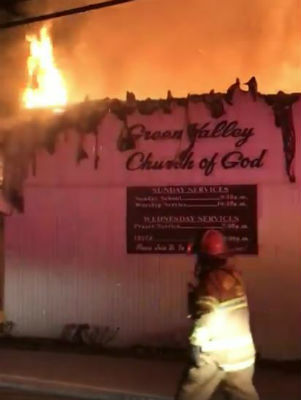 Instead of sleeping, several of the saints of Green Valley Church of God, in St. Albans, West Virginia, were wide awake. They’d gathered in the parking lot, gazing in horror as smoke and flame engulfed the place where they’d accepted Christ, got baptized, grew in their faith, and/or made lifelong friends. Thoughts raced through their minds: What’s next? How will this affect the ministry here? What in the world does God have in mind? In the trauma of the moment, God’s sovereign hand was hard to detect. But out of the bad, God was working for the good, ushering in a new beginning for Green Valley Church of God. Firefighter on the scene of the March 2017 fire. Tom Coll, pastor of the church since 2013, was first on the scene after the church’s security company called him about an alarm going off. The congregation had gathered earlier that evening at the church, leaving the church vacant by 8:30. Upon entering the church, Tom knew something was up. Smoke had begun to fill the hallways and sanctuary. When the fire department arrived, the fire chief assessed the situation and told Tom to “get out!” As the fire raged on, the water lines that serve the area couldn’t provide enough volume to extinguish, but only slow down, the blaze. The building was a total loss. Amid the questions and confusion, there was a sense of underlying hope. The same God who established the church in 1941 and sustained it since would provide for their needs in this dark hour. Tom recounts his vice chairman of the council expressing immediate assurance that a new beginning would certainly follow. The next morning, one of the pastors from nearby Maranatha Fellowship Church stopped by and invited the congregation to use their facility for worship. Pastor Tom welcomes guests to the dedication service. A holler is a narrow, creek-fed valley between mountains of the Appalachian countryside. Topography can be a blessing and sometimes a curse for residents and travelers alike, but it is in the heart of these hills that God’s power and glory has been revealed in awesome ways. March 2017 brought heartache and material loss to the congregation but could not shake their faith or resolve to press on. They would remain where God planted them, proving God’s faithfulness for all to see. The new Green Valley Church of God building. 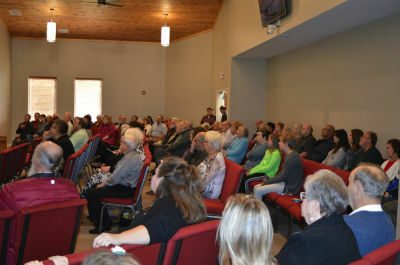 In April this year, the church held a groundbreaking ceremony for their new building, and in September, construction was completed. 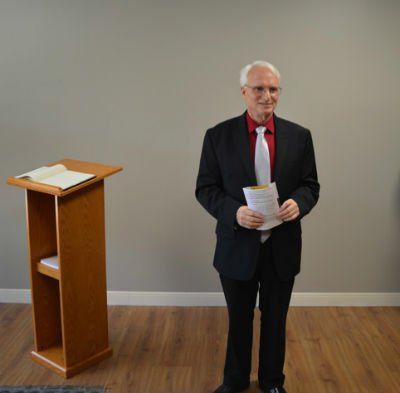 On October 21, at 3:00 in the afternoon, Green Valley Church of God held a service of dedication for the new facility, welcoming former pastor David Bowen, and another former pastor’s son, whose ministry has become well-known across the Movement. That son’s name—Mitchell Burch. 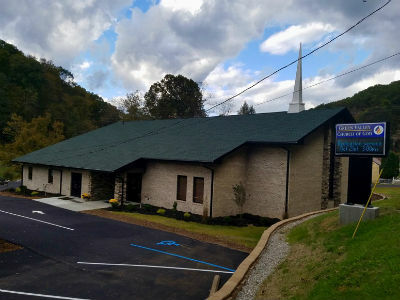 This entry was posted in All Church of God, Give Life, Northeast and tagged building, construction, damage, David Bowen, devastation, facility, fire, Green Valley Church of God, Mitchell Burch, property, rebuilding, recovery, restoration, Saint Albans, St. Albans, Tom Coll, turnaround, West Virginia, WV. Bookmark the permalink.